Beaphar Calming Home Spray has been formulated with soothing Valerian to promote feelings of calm and natural relaxation. 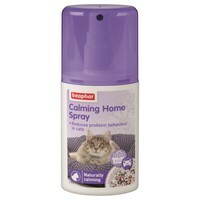 Designed for use around the home, Beaphar Calming Spray helps cats to feel more settled in strange or stressful environments and can prevent symptoms of distress and unwanted behaviour. Prolonged use can discourage behavioural problems such as scratching, constant meowing and spraying. Spray areas where the cat shows anxious and/or disruptive behaviour. Can also be sprayed on blankets, toys and scratching pots to help promote feelings of calm. Spray inside carriers or on blankets before travelling in the car. It works! We've 2 Bengal girls, they feel insecure when other cats visit outside, changes in the home (eg visitors, Xmas decorations, etc) that cause them to spray. It's been a problem. Found this range of products - a subtle squirt of this rather smelly product has made a difference. They now rub their chins where previously they would spray urine! Tip - I guve a little squirt at bedtime couple times per week, so the smell has cleared within a hour or two.